Thanksgiving is in only four days away, and we are all looking forward to it. For many of us, it is a time to eat, relax, and spend with family that we don’t always see very often. For kids, it is a time to eat delicious food, learn about history, and play with cousins. Before this busy time starts, if you want to spend some quality time with your kids, try making some of these Thanksgiving themed crafts. The Thankful Tree is a great craft to do with kids, and helps teach kids about the true meaning of Thanksgiving. To make this simple craft, collect some sticks from your yard, or buy some sticks from a crafting store. Take a large vase and put some stones or pretty marbles in the bottom to hold the sticks in place. Arrange the sticks in the vase with your child. Now the fun part! Cut out different shapes in paper of different colors. Punch a hole in each paper and tie a piece of string through each one. Hang the black pieces of paper on the tree. Whenever you feel grateful for something, take a piece of paper off the tree and write down what you feel thankful for. Hang it back on the tree for others to read. Ask visitors to write something for the tree. This makes a beautiful centerpiece and your kids will be proud to have helped make it. If Thanksgiving dinner is at your house, make sure each of your visitors adds a leaf to the Thankful Tree. If you have many littles coming over for Thanksgiving dinner, try making this autumn scented homemade playdough. Wrap a bit up in different bags so each kid gets their own playdough that they can play with when they get antsy. Start by making a regular batch of playdough, if you have a recipe you like, follow that. For our recipe, you’ll need: 1 cup white flour, ½ cup of salt, 2 tbsp. cream of tartar, 1 tbsp. vegetable oil, 1 cup water. You’ll also need ground cinnamon, vanilla extract, caramel extract, cinnamon apple spice tea bags, pumpkin spice, or any other spices or extracts to get the scents you want. Food coloring will get you the beautiful fall colors. For the Cinnamon apple spice tea, steep the tea in one cup of water and add that to the dough instead of plain water. Start by sifting the flour with salt and cream of tartar. Put it in a pot and add your water and vegetable oil. Turn on medium heat and stir! Never stop stirring, even when you add your scent to the batch. When the dough starts forming into a ball, take it off the heat and add your food coloring. Now knead the dough until you get the color you want. There is not a huge risk of your kids eating it, because it tastes disgusting, no matter how good it smells. Some warnings or light supervision might be needed depending on the age of your kids. Make sure to keep it away from pets as the large sodium content can harm them. Store it in an airtight container in the fridge, it should last for about a week. 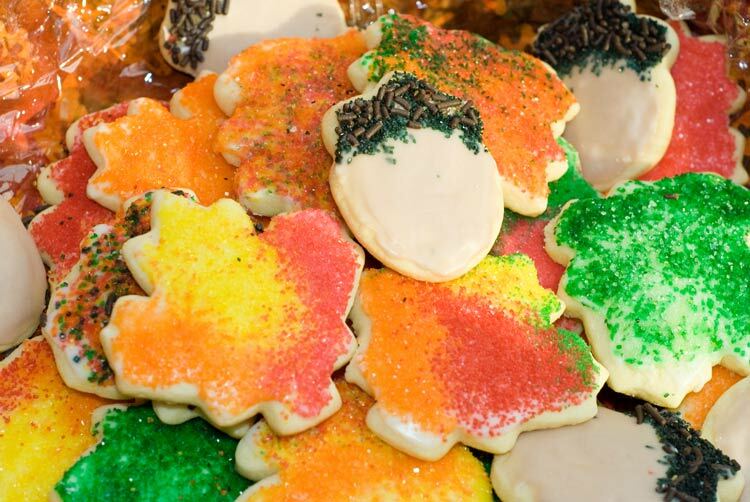 Making cut out cookies is a great project to do with kids because it can be as easy or hard as you would like it to be, and decorating them is always fun. For a simple version, just buy some refrigerated sugar cookie dough from the grocery store, roll it out and start cutting. Buy some leaf shaped cookie cutters from a craft store or grocery store. Let your little ones cut out the leaves, you can roll out and put them in the oven. After they are all cooked, make your own frosting or buy a couple tubes of frosting and sprinkles to decorate. These make a great gift for favorite aunties or uncles, or neighbors. Make one or all of these crafts with your kids this Thanksgiving for delicious, creative fun at home.